Head from Rio, home of the Bossa Nova, to the explore the caves and waterfalls of Bonito where yu can snorkel its incredible blue waters of Bonito. Head to the famous Pantanal region, a world heritage site and the largest continuous wetland in the world. Enjoy horse riding or jeep safari’s to discover the Pantanal’s diverse aquatic animal life, rich bird population, reptiles and mammals such as caimans, capybaras, monkeys, jaguars, armadillos, coatis and anteaters. Arrival at Rio and transfer to the hotel. Accommodation and departure to visit the Sugar Loaf Mountain. It was, at the feet of Urca Hill, that the city of Rio de Janeiro was founded in 1565 by Estácio de Sá. The visit is done in two steps, by modern cable-car. The first ride of the cable-car links Praia Vermelha to Urca Hill, located at 215 meters of altitude, a point from where you can see the entire Guanabara Bay and its islands, Flamengo landfilling, the Corcovado and Rio-Niterói bridge, besides the majestic mountains that protect and embellish the city. In the belvedere, there is a fast Food area, an amphitheater and a Heliport. The second cable-car ride, takes you to the top of Sugar Loaf Mountain, at 395 meters of altitude, from where you can see, in a unique perspective, the beach of Copacabana, Santa Cruz Fortress and some beaches of Niterói in a fantastic scenery. Return to the hotel in time for lunch (not included). 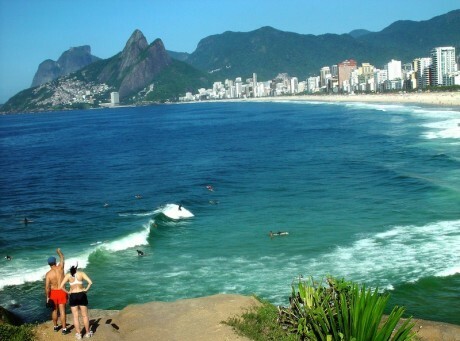 Optional: Hiking towards Urca Hill. We walk by Cláudio Coutinho way and take the trail to reach the Urca Hill. The first step is steep and the trail takes about 40 min. It can be decided locally and will reduce the time up there. *Moderate level. After breakfast, we’ll leave at 08am and travel to the Christ the Redeemer statue on Corcovado Mountain by Tijuca Forest. Afterwards depart to Tijuca National Park, stopping at the Chinese View belvedere. This park is known as the largest urban forest on earth. Inside the forest, walk through an easy trail. During the tour, usually we can see tropical animals like monkeys, monkeys sloths and exotic birds. Then we go to the charming district of Santa Teresa with its cobblestoned hilly streets, old homes and interesting museums. Return to the hotel for overnight. Breakfast and free morning. After lunch (not included), depart to Rio airport for flight (not included) to Campo Grander. Arrival and private transfer to the hotel. Free time. Overnight. The Lago Azul Grotto was discovered by a Terena Indian in 1924, and it is one of the most beautiful postcards of all the natural landscapes in the region. It´s a grotto with 80 meters deep and 120 meters wide a breathtaking vision of crystal clear water, no coincidence that the Blue Lagoon Cave is considered a Natural Monument. The title was given in 1978 by IPHAN (Institute of National Historical and Artistic Heritage) and guarantees its preservation and its access is strictly controlled. A trail and a rough staircase of 300 steps lead inside the cave, but none of this represents an obstacle to the spectacle of nature. Estância Mimosa is a mix of stunning and preserved nature and safety. Offers an authentic ecotourism experience. Member of the “Tour Experience”, a Brazilian Project which recognizes companies that are able to inspire and well serve the guests. Main tour: trail and waterfalls. An interpretive trail inside the forest stopping at eight cascades. Along the way, there are small caves, a paddling board ride and belvederes with good view of the Mountain Range. Important: This tour is cancelled when there is rain the day before the tour or on the day of the visit. The tour is not suitable for people with physical needs with limited mobility, people with hypertension, heart problem and labyrinthitis. Note: It is obligatory to use tennis shoes or closed footwear with rubber-soled. In the Recanto Ecologico Rio da Prata a gentle stream leads visitors quietly for a ride on a fantastic underwater world, inhabited by dozens of species of fish and aquatic plants. You’ll find yourself surrounded by several species of fish in the Pantanal, as piraputangas, curimbatas, pacu, piaus, and matogrossinhos, among others. In the Recanto Ecologico Rio da Prata there are 200 species of birds recorded. Snorkeling and scuba diving in Bonito and Jardim MS are extraordinary and impress the transparency of water and the rich biodiversity of the Pantanal. The bird watching and horseback riding are also part of the activities offered at the Recanto Ecologico Rio da Prata. Private Reserve of Natural Heritage – RPPN in the farm you can have an ecology lesson with our expert guides. Important: In rainy season the tour only happens in Olho D’Água at the final, it means that the last 500 mt by boat or trail will depend on the decision of the farm. OPTIONAL: 2 HOURS SNORKELING AT LAGOA MISTERIOSA (+ £55) Lagoa Misteriosa, which means “Mysterious Lake”, is a lake at the bottom of a sinkhole, a type of geological formation common in limestone regions. This lake of transparent waters impresses visitors for its incredible depth. It is considered one of the deepest submerged caves in Brazil, with more than 220 meters of water column (maximum depth reached by professional cave diver Gilberto Menezes de Oliveira, in 1998), which explains why is called mysterious. Lagoa Misteriosa is a phreatic cave, that is, was formed by the flow of underground water that dissolved the limestone in its passage. These types of caves usually are flooded and do not have fragile mineral deposits, such as speleothems. The tour begins with a short interpretive trail through the forest that surrounds the doline, an opportunity to observe the rich diversity of fauna and flora. The trail leads to the observatory, where you can admire the beauty of trees that covers the 75 meters deep doline, and see the Mysterious Lagoon at its bottom. The access to this lake of blue waters is made by a staircase of 179 steps, comfortable and safe. Groups are limited to 10 visitors, always accompanied by a local guide. Arriving on the access deck to the Mysterious Lagoon, the visitor receives the equipment that will be used for the snorkeling: mask, snorkel and life jacket. For those who choose not to snorkel, you can admire the blue waters of the lagoon. The snorkeling is indescribable: be amazed by contemplating the vastness of the Mysterious Lagoon, the vision of the two blue abysses on the bottom, the fallen tree trunks, the deposits of white sand and the small fish that glow with the light beams. The snorkeling is carried out in a circular loop in the Mysterious Lagoon. The Mysterious Lake impresses for its incredible depth and clarity of the water. Divers reported that visibility reaches 40 metres. Important: The Lagoon visitation is open all year round but we do recommend visiting it between April to September due visibility conditions. Included: Certified driver, ticket, mask, snorkel and life jacket and English speaking guide. After breakfast, private transfer to Pantanal, Fazenda Aguapé.. Dinner and overnight. Breakfast. Morning activity. Lunch. Afternoon activity. Dinner. Overnight. Optional activities include Horseback Riding, Boat tour, Hiking, Piranha Fishing, Nocturnal Animal Spotlight, Photographic Safari, Horse Carriage, Cattle Handling. Note: The activities always happen at the beginning of the day, afternoon until sunset and part of the night (after dinner) in the case of jeep. Type and duration of each tour depends on weather conditions and how the guests plan on staying with us. Breakfast and private transfer to the airport for flight (not included) to your next destination. Optional activities include Horseback Riding, Boat tour, Hiking, Piranha Fishing, Nocturnal Animal Spotlight, Photographic Safari, Horse Carriage, Cattle Handling. Note: The activities always happen at the beginning of the day, afternoon until sunset and part of the night (after dinner) in the case of jeep. Type and duration of each tour depends on weather conditions and how the guests plan on staying with us.